The wells that plunge 1,500 feet under Radcliffe Yard are out of sight to those walking over them. But to the facilities team there, they are well known as indispensable tools in the University’s fight against climate change. First installed a decade ago when the technology was still in its infancy, the wells are part of a geothermal system that reduces carbon emissions by using the natural heat stored deep underground for heating and cooling buildings. Through a process of continual testing and improvement that included the help of undergraduate engineering students, the system has been expanded twice to serve all of the historic brick buildings surrounding Radcliffe Yard. 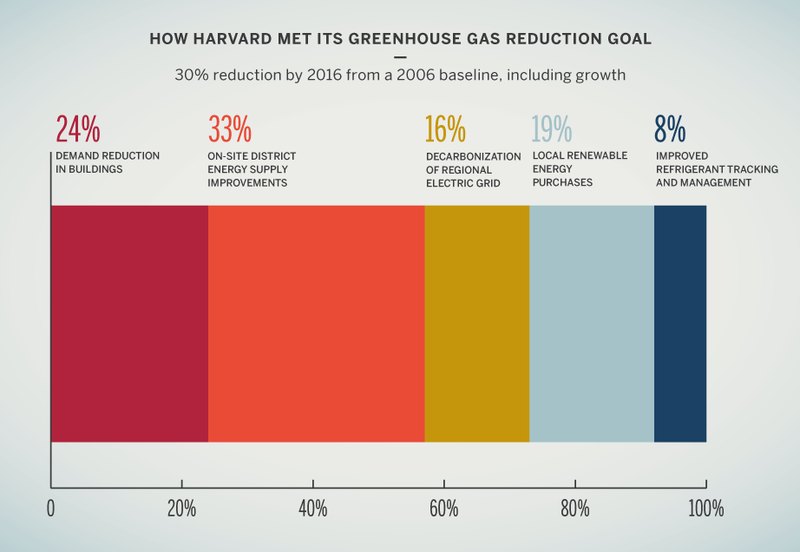 In a report released today, Harvard University details the path it took to achieving its goal to reduce greenhouse gas emissions 30 percent by 2016 from a 2006 baseline, inclusive of campus growth. The steps included energy audits and energy efficiency measures across most of the 25 million square feet of campus, installing renewable energy technology including the Radcliffe geothermal wells and thousands of solar panels on rooftops, and fuel-switching and other improvements to campus utilities that lowered carbon pollution. The transition of the regional electric grid away from coal and oil to natural gas also contributed to Harvard’s progress via the electricity its Schools and departments purchase. Excluding growth, Harvard saw a 40 percent reduction in emissions over the 10 years. Spurred by student advocacy and the urgency to act on human-induced climate change, Faust announced on a crisp fall afternoon in 2008 the ambitious greenhouse gas reduction goal at an event featuring former Vice President Al Gore, attended by more than 15,000 members of the Harvard community. The effort was recommended by Harvard faculty to be science-based, aligned with the trajectory that climate scientists said was necessary to avoid 2 degrees Celsius of global warming rather than what would be achievable through on-campus reductions alone given the projected growth in square footage. 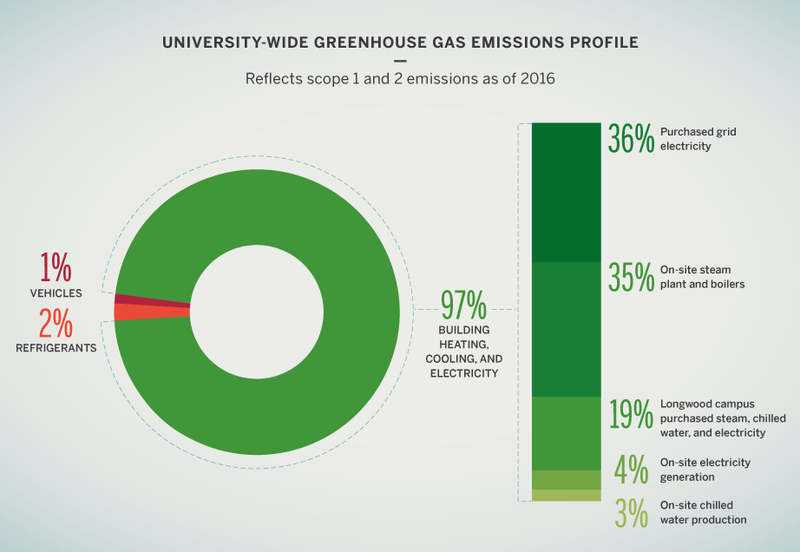 The goal was designed to account for the full scope of the University’s emissions footprint, taking into consideration growth and the over 600 Harvard-owned and Harvard-operated properties across North America. It immediately spurred a University-wide campaign to curb energy and emissions on campus, in part through projects like the solar thermal and steam tunnel heat-recovery system installed at Canaday Hall, which provides hot water to all freshmen dorms in Harvard Yard. The Office for Sustainability led and managed implementation of the goal in coordination with facilities and administrative teams throughout campus. A two-year planning process that included the participation of hundreds across the University resulted in a campuswide Climate Action Plan that framed how Harvard would approach the challenge of drastically reducing emissions associated with its operations. An executive committee co-chaired by Harvard Executive Vice President Katie Lapp, Faculty of Arts and Sciences Dean of Science Jeremy Bloxham, and former Harvard Business School Professor Robert Steven Kaplan oversaw the effort. An “energy efficiency first” strategy was launched to reduce energy demand from dorms, laboratories, offices, and other spaces, reflecting the fact that 97 percent of University-wide emissions are associated with heating and cooling Harvard’s buildings. Aggressive energy reduction targets were incorporated into new University-wide Green Building Standards, and energy and emissions projects were incorporated into the five-year capital planning process. What’s more, energy audits were performed across campus to identify energy conservation opportunities. The energy and electricity being used to power Harvard’s buildings is also cleaner than when the goal was set. The University’s district energy systems, which serve hundreds of campus buildings in Allston and Cambridge, were upgraded to improve the efficiency, reliability, and performance of on-site steam and chilled-water production. Switching the fuel source at the Harvard-owned Blackstone Steam Plant from oil to natural gas accounted for the largest portion of emissions reduction. An expanded, combined heat and power system, new backpressure turbines and boilers, and other efficiencies also contributed to an overall reduction from campus utilities of 20,500 metric tons of carbon dioxide equivalent (MTCDE), equal to taking 4,300 cars off the road. 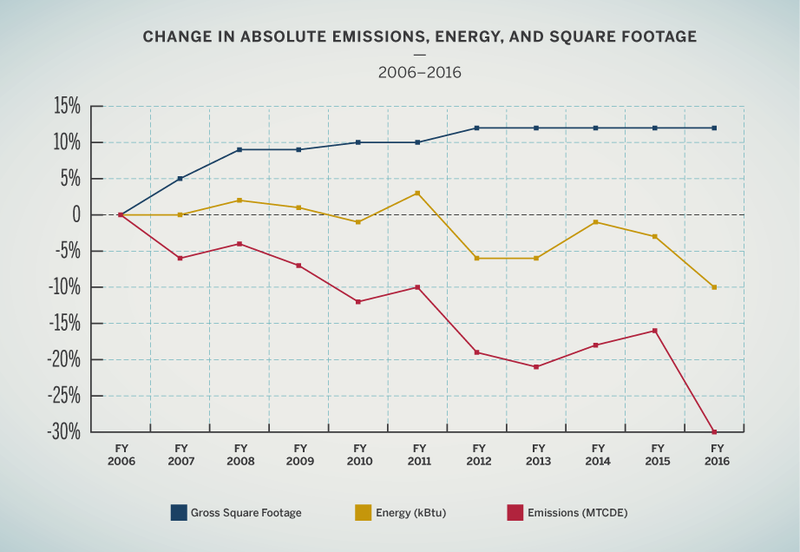 The electricity Harvard buys from the regional electric grid also has become cleaner over the past decade as oils and coal have been replaced by natural gas, which produce fewer emissions. Renewable energy and hydropower have remained steady, they represent a small percentage of overall energy production. In a bid to advance the transition to a carbon-free future, Harvard was also an early adopter of renewable energy. In 2009, Harvard entered into a long-term power-purchasing agreement for 12 megawatts of carbon-free energy from the Stetson II wind farm in Maine, making it the largest purchaser of wind energy by a college or university in New England at that time. The Renewable Energy Certificates (RECs) from the project have been retired for two purposes: first, to meet the regulatory requirements of the Massachusetts Renewable Portfolio Standard, which the University is subject to, and, second, to meet a small portion of Harvard’s emissions reduction goal. Excess RECs are sold. Over the past decade, the University’s Schools and departments have piloted emerging renewable technologies, including small-scale wind demonstration projects, solar hot water, and biomass. Eighteen on-site solar photovoltaic projects dot the roofs and grounds of Harvard’s campus, producing more than 1 megawatt of power. In aggregate, these projects have helped to diversify the University’s energy supply while serving as a testing ground to inform future investment in renewable technology. Harvard continues to explore and to test on- and off-site renewable opportunities to transition to lower carbon operations. The University recently became the first higher education institution to join the Rocky Mountain Institute’s Business Renewables Center, a group of industry leaders working together to streamline and accelerate how organizations purchase off-site, large-scale wind and solar energy projects. On a regional level, Harvard is working through the Boston Green Ribbon Commission to generate a greater understanding of the possibilities for large-scale renewable investment in New England. And on the local level, a campus-wide renewable energy study, performed by the Office for Sustainability in 2015, identified opportunities for additional rooftop and ground-mounted solar installations. 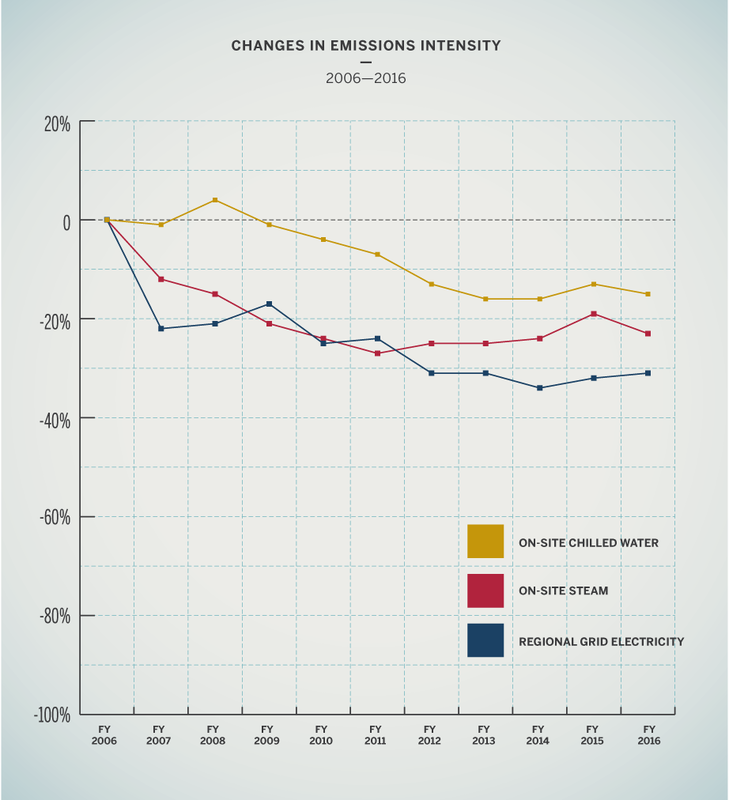 Due to the aggressive nature of Harvard’s emissions reduction goal, it was always anticipated that off-site emissions mitigation projects would be required to complement those reductions achieved through changes to energy supply and demand. However, the University intentionally waited until near completion of its climate goal to analyze those options, choosing first to exhaust as many on-site reduction opportunities as possible. A faculty-led advisory group, co-chaired by Bloxham, Kaplan, and Harvard Kennedy School Professor Henry Lee, was convened in 2015 to help guide Harvard’s decisions on the selection of off-site mechanisms. The group determined that the University could have an outsized role in studying the complex, evolving market for off-site emissions. “We sought to deliver a clear framework for how Harvard can both navigate the often confusing offset and off-site emissions mitigation markets, in part by pursuing verifiable and credible projects that will produce meaningful reductions in emissions and in part by establishing a process, involving faculty and students, to identify future opportunities for Harvard to reduce its carbon footprint,” said Lee. Following the advisory group’s guidance, Harvard is funding a three-year, multidisciplinary graduate-level Climate Solutions Living Lab course as well as research projects to design and analyze various off-site means to achieve carbon neutrality. Research findings will inform the University’s approach to coupling off-campus emissions reduction opportunities with on-campus efforts to meet its long-term climate commitment. “Not only will this course and others like it provide students with the opportunity explore real law and policy challenges related to climate change, it will be a model for collaborative learning by leveraging the expertise of faculty, students, and staff across our many Schools to devise solutions together,” said Martha Minow, the Morgan and Helen Chu Dean and Professor of Law at Harvard Law School. As an interim step, the University used criteria provided by the faculty advisory group to identify a mix of off-site options to complement the reductions from energy supply and demand. The mix included regional, national, and global renewable and offset projects. In 2016, once it was determined exactly how much MTCDE reduction from off-site sources would be needed, the University purchased wind from the Stetson II project in Maine and existing hydro from Massachusetts to meet the goal. The other options identified were not needed, as the on-site reductions were larger than projected. As part of the management of the goal, a detailed, world-class emissions inventory was developed to accurately measure and report on direct and indirect emissions across campus. The inventory provides robust data with which to understand how and where to best target reductions in emissions. 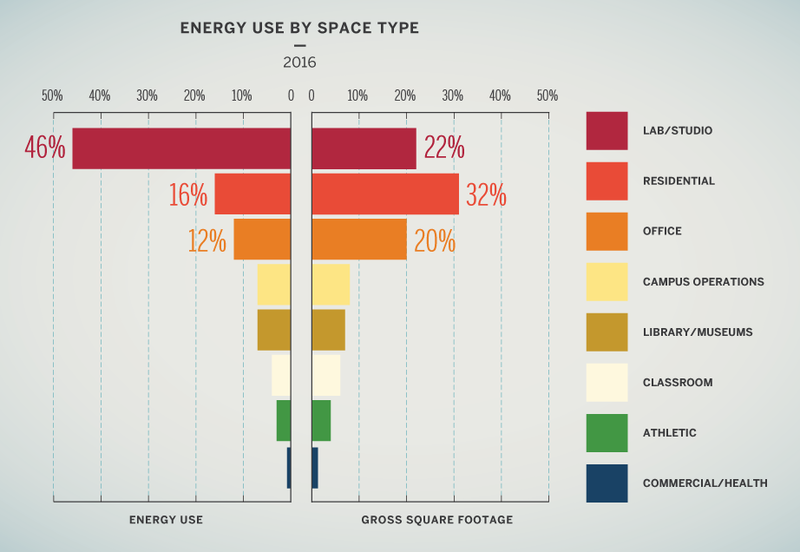 For example, it shows that while laboratories make up 22 percent of campus space, they account for 46 percent of energy use, illustrating the unique challenge faced by research-focused organizations in reducing their carbon footprint. The emissions inventory is in the process of completing verification to receive Climate Registered status. Management and tracking of short-lived pollutants in the inventory improved since 2006, resulting in more accurate data on the actual losses of refrigerant gases and their associated emissions impact. Using guidance from the Climate Registry, the baseline was not adjusted because the relative amount of emissions was small. However, due to historical overestimations and some reductions in use, refrigerants appear as a decrease in the emissions inventory and therefore contributed to meeting the goal. Harvard’s faculty and research community continues to contribute solutions and new insights across a wide range of disciplines. The University is preparing to use the blueprint developed in meeting the 2006–2016 climate goal to envision a new set of climate commitments that will define its work on campus over the next decade. A Climate Change Task Force composed of faculty experts, senior administrators, and students has been convened to deliberate how Harvard can best model the transition to decarbonization. The committee, which is co-chaired by Harvard Business School Professor Rebecca Henderson, Harvard Kennedy School Professor Bill Clark, and Lapp, plans to deliver its recommendations to Faust next spring. Collaboration at the local, regional, and international levels will continue to be a critical component of Harvard’s future climate action strategy. The University’s existing partnerships with local governments and business leaders in Cambridge and Boston provide a strong example of how working together on common challenges can help lead to more effective results. For example, in Cambridge, Harvard was involved in the team that developed an aspirational, 25-year Net Zero Action Plan. In Boston, the University leads the Green Ribbon Commission’s Higher Education Working Group, which has hosted two regional symposiums focused on targeting energy reduction in research laboratories. Regionally, Harvard collaborated with four of its higher education peers and the Commonwealth of Massachusetts to build the extremely energy-efficient LEED Platinum Massachusetts Green High Performance Computing Center in Holyoke. Powered by hydroelectricity, this facility provides state-of-the-art, low-carbon infrastructure for computationally intensive research being conducted by its faculty. James Cuff, assistant dean and distinguished engineer for research computing, is the principle investigator on a $4 million NSF grant to develop the North East Storage Exchange, a collaboration of five local universities to provide easier storage and faster retrieval of massive quantities of data.